Tina is a 1-year-old red female born May 22, 2015. Her sire is Flying Man of God and her dam is Tiger Girl. She has not been individually registered. Tina has an injury or birth defect to a leg or foot that prevented her from racing. She is being evaluated by our vets. Tina has passed a cat test and is living in a foster home with cats. 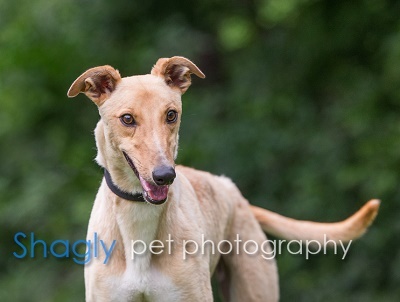 Playful little Tina is like a little zip file ready to unzip as part of your family! This young girl fits right in with the three dogs and two cats in her foster home, playing and sharing toys and resources well. She has passed a cat test, and she does enjoy the occasional friendly play and chase. She would probably do best in a home with another dog to play with. She enjoys a daily walk, although she’s still a little nervous about joggers, loud trucks, and bicycles. She’s shy with new people at first but warms up nicely, given a gentle hand. Because one of her back legs was broken or has a defect of some sort, she was never trained to race and wouldn’t be suited to agility trials or other intense physical activity. Tina crates smoothly with prompting but does not need to be crated when her foster people are away; she’s done quite well confined to one or two rooms with other hounds during the day. She does know how to climb stairs, and she does not get on the furniture during the day. She enjoys sleeping on a dog bed in the bedroom with her foster mama. Tina’s still just a year old and still going through her puppy stage, and she’s still polishing her potty training and indoor manners. She does indulge in a little extracurricular chewing of paper or any clothing that’s left accessible. Her foster mama is teaching her not to steal clothes and shoes out of the hamper, and potty training is progressing. 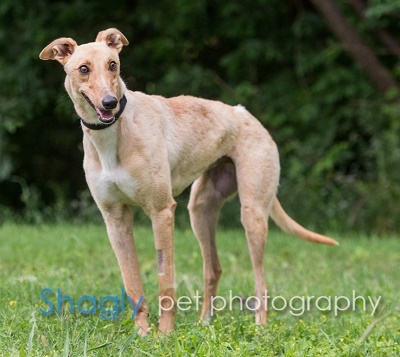 Tina is a sweet young girl who’s ready to learn to fit into a family. Give this little red fawn a chance!